Dionysus (Roman equivalent is Bacchus) was the god of the grape harvest, winemaking and wine, of ritual madness and ecstasy in Greek mythology. He was the most cheerful of the gods and one of the most beloved to the people. 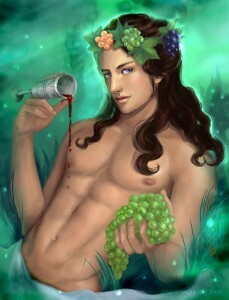 As Prometheus gave them fire or Asclepius put the foundations of medicine, so Dionysus offered them the vine and wine. Hestia gave her Olympian seat to Dionysus and he became one of the twelve Olympian Gods. 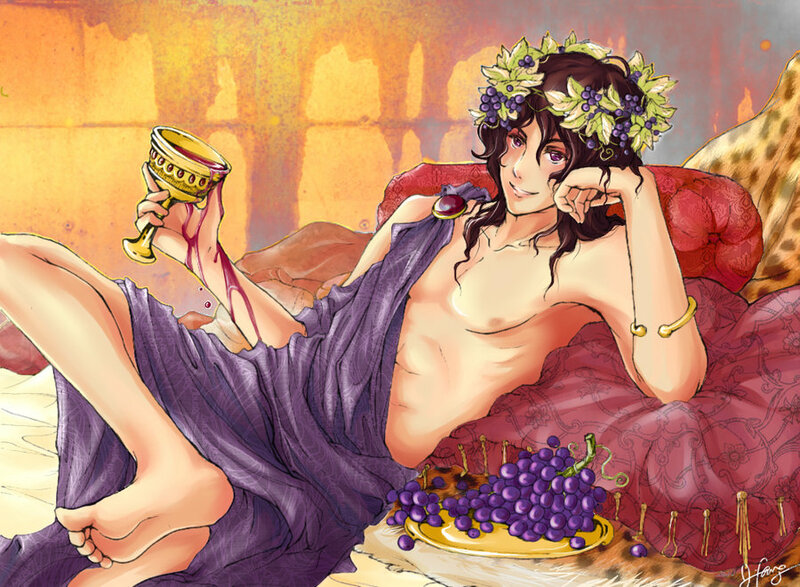 Dionysus was very likable to other gods. Furthermore, he had helped them several times. Invaluable was the participation of himself and his comrades in the battle which the gods gave against the Giants. All gods respected him, but especially Hera owed him great gratitude, since he alone of all the gods, persuaded her son Hephaestus to return to Olympus and to free her from her shackles. The merry god then traveled and visited many countries and states to teach people how to cultivate the vines and how to make wine by their fruits. And of course, as the god of joy and mirth, he was not travelling alone. He was followed by a bustling crowd. This crowd consisted of women who danced with frantic way, the Maenads, and strange beings who were humans and animals together. They were called Silenus and Satyrs. Faithful followers of God were marching with him on his long journeys. 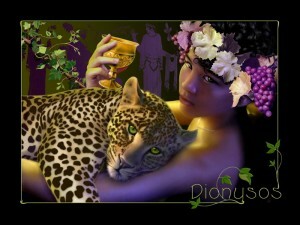 With Dionysos as the head of the crowd, they crossed Egypt, Libya and other countries in Africa. Then they went to Asia, the Arabs, the Lydians, the Phrygians, eventually reaching India, where even the most daring navigator failed to reach. In some places they were friendly welcomed, although in other places they were teased or even treated as enemies. But what always prevailed, was the kindness of Dionysus and his companions. He quickly reconciled with the residents and started teaching them how to cultivate the vine. The wonderful drink that the god was treating, scattered joy and fun everywhere. It was making people forget their worries and was bringing smile on their faces. From everywhere Dionysus was passing through, a joyful party was starting and you could not hear anything other than the cheerful sounds of musical instruments and lively songs. So how could these people avoid worshipping this god? And he was a god, although his mother, Semele, daughter of Cadmus, king of Thebes was mortal. Dionysus, however, acquired immortality, which separates the gods from the mortals not only because Zeus was his father, but more because he was born of God for the second time. As strange as it sounds, Dionysus was born twice. When Zeus was captivated by the beauty of the virgin Semele, he approached her and joined her. The fruit of their union was Dionysus. The jealous Hera was not planning to leave inexcusable this infidelity of her husband. Blinded by jealousy and thirsting for revenge, she appeared in front of Semele and cunningly persuaded her to ask of her lover to appear as a god and not with his human form, as he usually appeared before her. This would prove that he loves her truly. The naive and unsuspecting daughter of Cadmus, the next time Zeus visited her in her chambers, asked him to get his divine form. Zeus tried, in vain, with loving words to persuade her. Bending finally by her persistence, he took his divine form, appearing majestic and bright in all his divine glory. It was impossible for the unfortunate mortal woman to withstand the flash of the lightning that was coming from his hands. While Semele was engulfed in flames, Zeus saved the infant who was in her womb, by talking it and sewing it in his thigh. 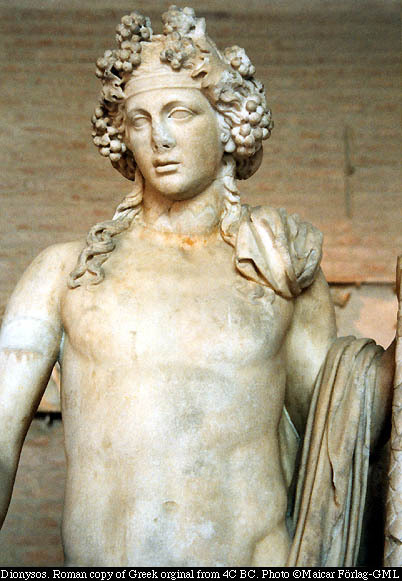 When the nine months were completed, Dionysus was reborn from the foot of his divine father. The king of the immortals knew very well that his jealous wife would quickly turn her anger on the newborn child. 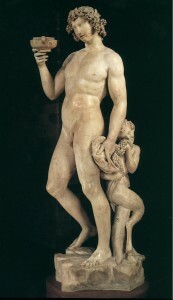 So he asked Hermes to take the child in his custody. 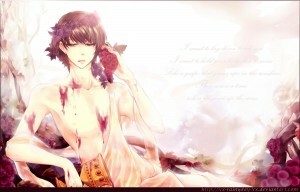 He then gave it to Semele's sister, Ino. But, the cunning Hera sent madness to Ino and her husband and they began to mercilessly kill their children. The goddess was thinking that hopefully they would also kill Dionysus, but the winged god caught up and saved little Dionysus trusting him this time to the Nymphs. 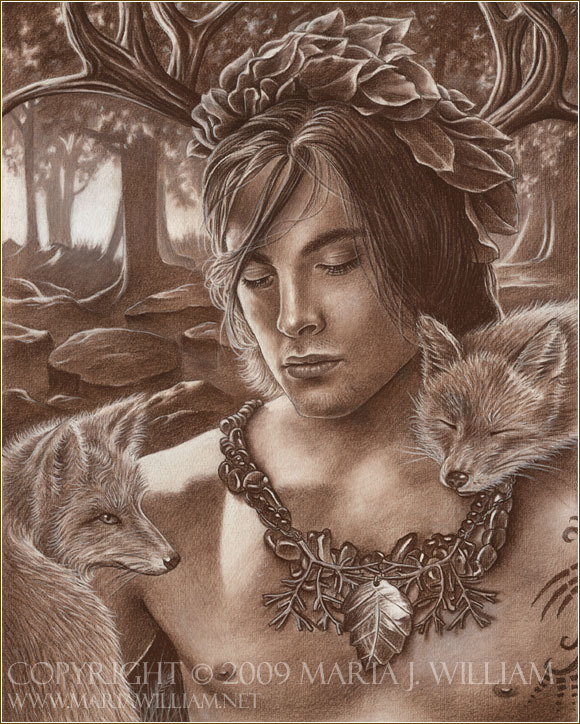 They raised him with great affection, in the forest they inhabited. Indeed, we could not imagine a more ideal place for the god of vine to grow up, despite an idyllic landscape with trees and colorful flowers. There he never met any people. 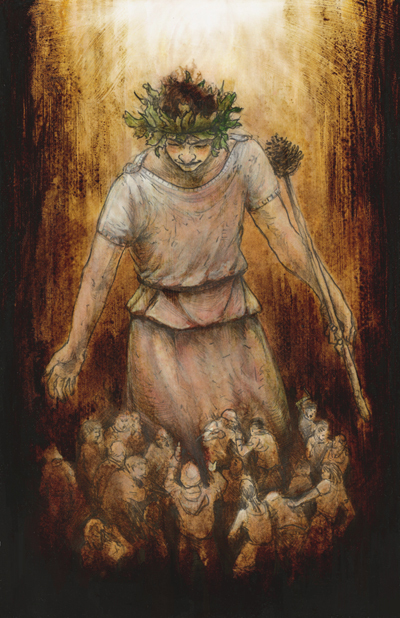 And when the king Lycurgus disturbed their tranquility by chasing the Nymphs, scaring Dionysus to death, he was punished viciously by Zeus who blinded him. 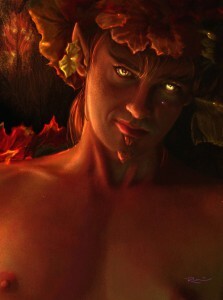 The punishment was always so harsh for all those people who conspired against the god Dionysus. Some Tyrrhenian pirates who captured the god shared the same bad luck. When they saw a so beautiful and robust young man, they believed that he was a noble or even a king. Delighted with the thought that they would reap a huge ransom for releasing him, they tried to tie him with heavy chains, but they did not succeed. A small movement from that God blew it over. The foolish mortals, however, continued their efforts. Only the steersman of the boat tried to restore them to their senses, screaming to them: "Are you so foolish that you don’t you see that we have to do with a god here? Are you not afraid of his punishment? Maybe even Poseidon, will avenge us throwing our ship in a wild sea storm. The best we have to do is to set him free. " The captain and the rest did not agree in letting "such a treasure" leave. At that time, red wine began to flow in the boat that stunned the sailors with its divine aroma. Simultaneously a vine began to wrap the mast and spread it’s, loaded with juicy grapes, branches all over the boat. And while the bemused sailors were watching, another miracle happened before their eyes. The handsome young man who wanted to capture, transformed into a wild lion that started roaring forcing the sailors to jump into the sea to escape. Then Dionysus transformed all of them into dolphins, leaving only the helmsman untouched and rewarding him for his own prudence. 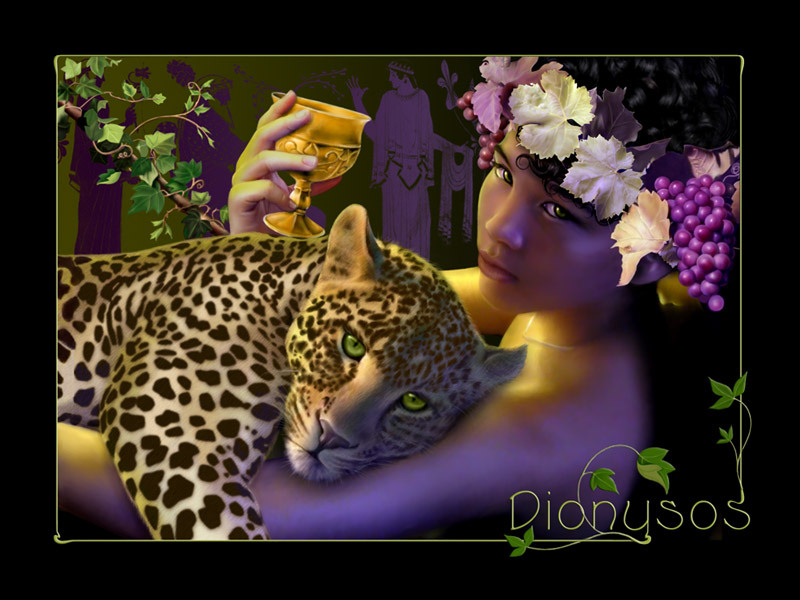 As we have seen, Dionysus was loved and adored by the people because he introduced them to the great taste of wine. They say that for the first time he revealed it to Eneas, the king of Aetolia. His shepherd, Staphylos, had found a strange plant full of fruits and excited by their taste brought some to the king in order to please him. Eneas squeezed the juicy fruits and enjoyed their rich juice. 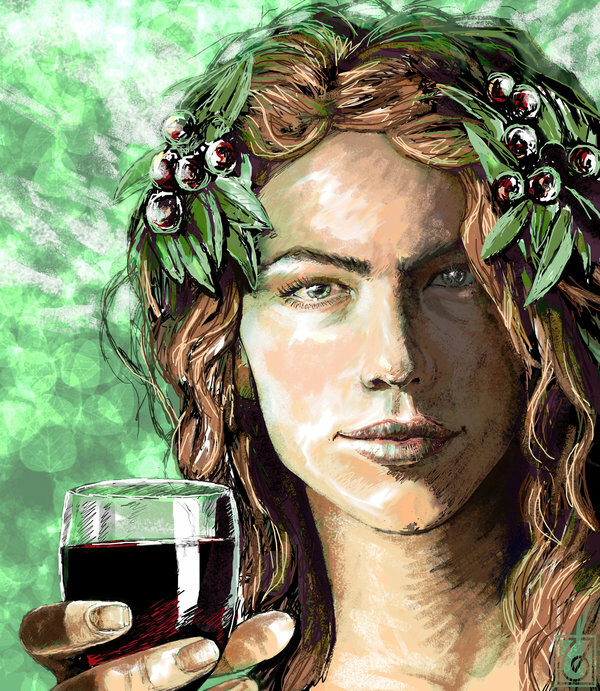 Since then, Dionysus named the juice as wine (Oinos is wine in Greek Language) and the fruits as wine grapes from the name of the shepherd (Staphylos in Greek is grapes). 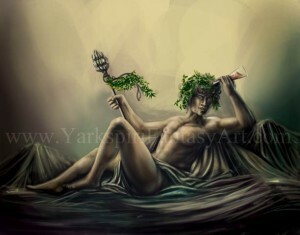 Always with thyrsus in one hand and a pot of wine in the other hand, he was traveling from town to town. Wherever he found friendly and jovial people, he taught them how to make wine. That is what happened to the residents of Ikaria, in Attica, who greeted him with enthusiasm. Shortly before leaving their place, Dionysus advised the king, Icarian, to guard the well made Icarian wine. But he did not follow his advice, thinking "what harm can come from such a pleasant drink!". One day, his shepherds found the barrels and drank so much wine, that drunk and began to behave very violently. Having lost their sense of logic, they killed Icarian and his daughter Irigoni, feeling extremely sad, committed suicide. The inhabitants of Ikaria particularly honored the god Dionysus. This region cultivated the dithyramb a lot, a hymn to the god composed by the musician Arion. Additionally, they added something new. In this musical anthem, they added lyrics. And since in this composition the singing people were disguised as goat shaped Satyrs, they called it tragedy (tragos in Greek is goat). Of course, religious ceremonies for the god of the vine were made in many other areas. Those attending to these events should participate actively drinking wine and dancing under the influence of intoxication. Those who refused were enemies of Dionysus and drew his rage. 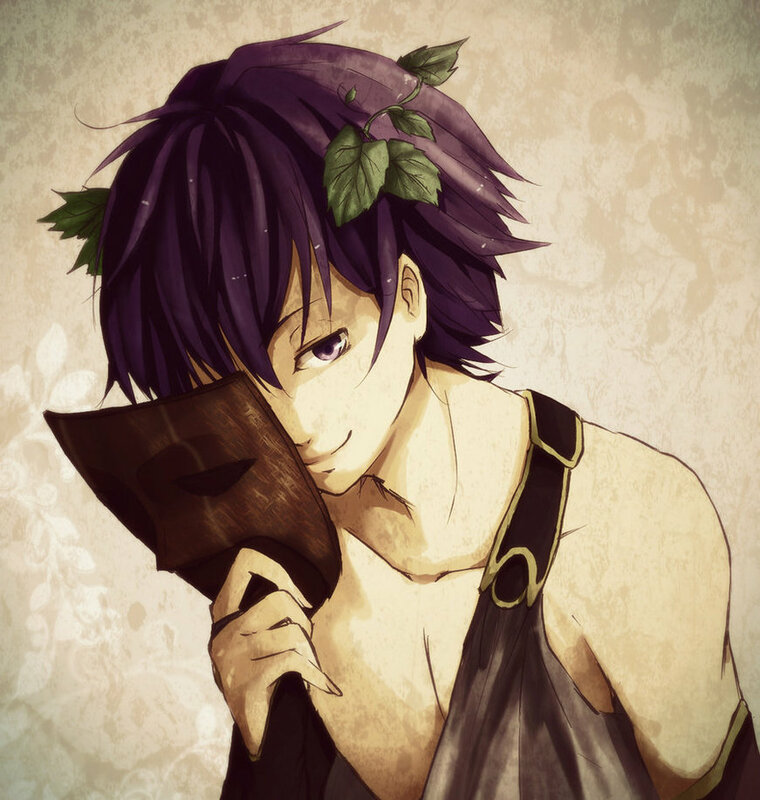 So, a tragic end found Pentheus who wanted to secretly monitor the orgiastic feasts. Maenads, one of which was his mother, occupied by their fury and anger, pounced on him and mangled him. The daughters of King Minos, as also the daughters of king Proetos, were continuously refusing to take part in these religious ceremonies. Dionysus, being insulted and angry made them lose their minds. Others say that the fury that gripped the young daughters of Proetos was Hera’s doing. Dionysus appears as harsh punisher to his enemies and to those who are opposed to the way of his worship. Yet, he is a very generous benefactor to those who honour him and thank him. When King Midas hosted his teacher, the old Silenus, who had been lost, he agreed to fulfill his desire to please him. The greedy Midas asked him to give him the ability to convert anything he touches to gold. Soon, the poor guy found out that he would become fabulously rich but would soon die of hunger and thirst. The bread he touched to eat was turned into gold and the water he wanted to drink was turned into golden drops. Being very sorry, he asked God to make him like before and Dionysus that took pity on him told him that if he bathed in the waters of the River Pactolus, his martyrdom would cease. The god of the feast didn’t have many love adventures like the other gods. The women in his life had a different position. They were nannies when he was small and companions in his nonstop celebrations when he grew up. He once fell in love with the beautiful Ariadne, when he saw her sleeping calmly and serene, looking like a goddess. The daughter of Minos, along with Theseus returned to Athens from Crete. Waking up one morning in Naxos, Ariadne saw that her partner left and abandoned her. Without her knowing it, Dionysus had come to the dream of Theseus and with threats forced him to leave, planning to make the beautiful young woman his own. All alone as she was in the desert island, Dionysos, young, stocky, wreathed with ivy leaves as usual, appeared like a savior in front of her. After having their marriage, they flew towards the sky with the chariot of the god. On earth, people were thanking him for his divine gift and for the peace of mind that he generously shared. The celebrations in his honor were a perpetual feast where everyone got drunk and sang. In this way, they tried to contact with their dear god. This history lesson was very informative. I was not aware of his history in such detail. Thank you so very much and I will continue to follow your articles about other Great Greek Gods. I found the article interesting, however, being an English tutor makes it difficult to read anything without doing a mental edit. I suggest you have several people proof read before posting. I found spelling errors, fragmented sentence, and rather confusing pronoun use. It would also be beneficial to have your sources listed, along with citations for you pictures. Research credentials are required for students, as well as making the website look creditable. I would caution you on the artwork and giving others permission to draw it. One of the illustrations has a copyright, therefore, listing the copyright and artist would be better than listing the website alone. It was a good article and I really enjoy this site.